Karen brings unique skills as a social worker, attorney, small business owner, arbitrator and mediator, and community activist to build consensus and solve problems as Senator. As an arbitrator and mediator, Karen specialized in labor and employment law as well as community and court mediation. She also worked as a labor and employment attorney on behalf of employees, unions, the Massachusetts Water Resources Authority (MWRA), and the Commonwealth. Karen has a long standing and wide ranging commitment to community activism. She served as Chair of Ashland’s Personnel Board and Fiscal Affairs Committee, and Vice Chair of the Fiscal Affairs Committee before becoming Chair of the Ashland School Committee. Her leadership on education compelled her to found the Chapter 70 Roundtable, a statewide coalition to fight for equity, adequacy and predictability to education aid in suburban towns. 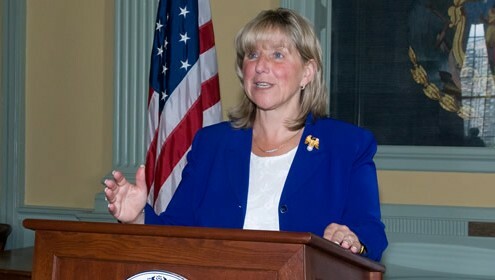 She continues to be a member of the MetroWest Chamber of Commerce and is on the Board of the 495/Metrowest Partnership. Prior to becoming Chair of Economic Development, Karen was named the first Senate Chair of the Joint Committee on Children, Families and Persons with Disabilities. In this role, she continued her strong and vocal advocacy on concerns—such as child safety and self-sufficiency for individuals with disabilities—that have been important to her since her days as social worker. Hero Standing Strong, Advocates Inc.